Introducing the revolution in Home Gyms with the Bodycraft GXP Single Stack Home Gym. There are many Home Gyms in the marketplace but none provide the smooth feel of the Bodycraft GXP Single Stack Home Gym. Rated highly by many users and Fitness experts gives this Home Gym a top spot on our list for home and institutional use. With its high quality and smooth feeling, its no wonder why many customers are buying the Bodycraft GXP Single stack Home Gym over other top name Brands. Bodycraft GXP Single Stack Home Gym is a leading Home Gym in the fitness industry. The Home Gym where beauty meets function. Can fit into small spaces and has over 100 different types of exercises. Economically priced for the person with a tight budget. 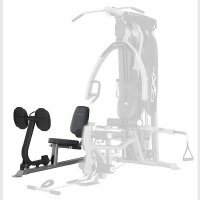 In 2001 BodyCraft created the first Hybrid Home Gym with the release of the XPress. 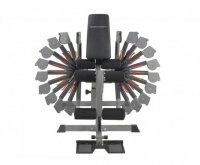 By combining the traditional exercise stations found on your typical gym with the functionality of cables, the result was the flexibility of free-weights, sports and core training, all rolled into a ultra-compact machine. In 2007 we released our latest version of the Xpress, the GXP. This gyms features an even heavier, and more compact frame, (reducing the depth by 20") and a more aesthetically pleasing design. The BodyCraft GXP Home Gym is as much a piece of art as it is a top quality piece of Strength Training Equipment! From the beautiful flowing curves of the wide oval steel tubing, to the laser cut Functional Training Arms, to the Aluminum Accent End Caps, extreme attention to detail has been paid. The BodyCraft GXP Home Gym is unique in several ways. Bench Press Stations with adjustable starting point. This allows for different size users and also provides a variety of exercises including Bench Press, Incline Press, Shoulder Press and Mid Row. Seat and back are adjustable. Back pad tilts to ensure full support when performing incline and shoulder presses. The BodyCraft GXP Home Gym Back pad tilts to ensure full support when performing incline and shoulder presses. Cable Station with adjustable arms, allows for a very wide array of exercises including Functional Training, Sports Specific, Core Training, and exercises that mimic Dumbbell Training. Unique Doubling Cable increases the resistance to a 2:1 ratio, providing for up to a 400 Lb. bench press. Cable Station with adjustable arms, allows for a very wide array of exercises including Function Training, Sports Specific, Core Training, and exercises that mimic Dumbbell Training. Leg Extension and Curl Station provides Seated Leg Extension and Standing Leg Curl. Sealed, internally lubricated bearings for exceptionally smooth performance. Options available: leg press option. Optional Leg Press for full leg development. With the optional leg press you can start exercises your legs for better results. Straight Bar - Used for exercises such as arm curls, low rows, triceps push downs, and more. Ab Strap - Use for abdominal crunches, mid rows, triceps push downs, and more. 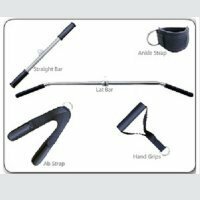 Single Handle - Use for One-handed exercises such as arm curls, triceps extensions, rows, and more. Since it is built to last a lifetime, every part of the BodyCraft GXP is guaranteed for as long as you own it. We will replace or repair any defect. Warranty applies only to the original owner and for in-home use. Compact! Less than 4-1/2 feet deep! Easy adjusting seat! Simply reach down and squeeze the adjustment handle. The spring-loaded seat will automatically raise, or lower using your own body weight. All without having to stand up! Up to 400 pounds resistance from the standard 200 pound weight stack! Simply hook the permanently attached "double-up" cables to the. Functional Training Arms and the resistance is doubled! Orthopedic Seat Back! Seat and seat back are made with dual-density foam; soft on top, dense underneath. Exclusive design of the seat back provides great lumbar support while reducing stress on the spine. Versatile! Literally hundreds of strength training exercises can be performed on the BodyCraft GXP Home Gym Train for your specific activity, sport, general toning, or for pure strength and size! Adjustable Cable arms. Invented by Bodycraft, this option provides for an additional vast array of exercises, including functional training, dumbbell exercises and sports specific exercises. This option more than doubles the amount of available exercises. With the Bodycraft GXP Single Stack Home Gym you have a choice between four different colors that the gym can go in. Choose the color that best suits you and matches your room color scheme. The gym comes in the following colors: Sea Green, Graphite, Satin White or Bronze.